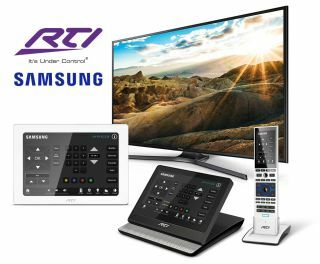 The What: RTI has introduced a driver for IP control of select 2017 Samsung TVs and 2018 Samsung 4K UHD TVs starting with the NU8 Series and including the entire QLED series and The Frame TV. The What Else: The new driver delivers control over the DTV tuner and on-board DirecTV interface of Samsung 4K Ultra HDTVs, in addition to direct one-button access to streaming sources such as Hulu and Netflix on the displays. Users can control the screens using the RTI interface of their choice, where they can view feedback on volume levels, programming, and more. By connecting to the Samsung displays via the network, the driver eliminates the need for integrators to run additional IR emitters or serial cables. The Bottom Line: By utilizing a network connection, the new driver simplifies the integration of Samsung TVs into RTI automation and control systems to provide consumers with a full-featured control experience.